Or rather not Cas(s)’s grace (should Grace be capitalized?). A few things about this. First of all, the whole Cas(s) as a human thing didn’t last very long. Of the 9 episodes they’ve aired this season, Cas(s) has appeared in 4. There’s was this whole big to-do about Cas(s) becoming human and it lasted 4 episodes. 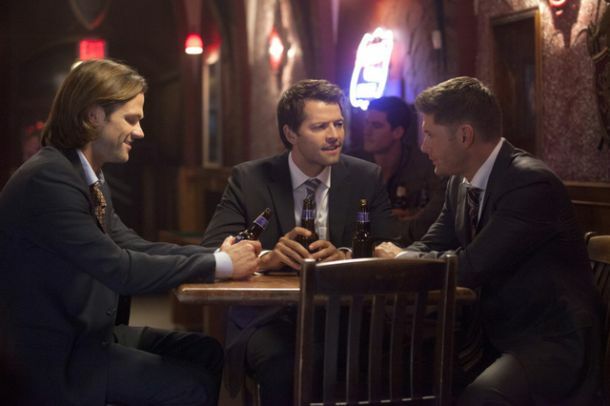 Now, Jeremy Carver (who did not write “Holy Terror,” it was writing partners Eugenie Ross-Leming and Brad Buckner), wrote what I think is widely considered the best Castiel episode in the show: “Free to Be You And Me.” The reason that episode works so well is that Castiel is experiencing what it’s like being human. Over the course of season 5, we witness a lot of his “firsts.” And I think a lot of fans were excited to see a continuation of that this season, as he wasn’t only spending time with humans, but was actually properly human. And based very much of “free to Be…,” I trusted Carver with that plot twist. Instead this phase lasted just long enough for him to show up homeless, lose his virginity, work a stint at a gas and sip, and go back to being an angel. And really I think they don’t know what to do with him. They can’t take him off the show because the fans go nuts (I admit, I wanted him back, he’s my favorite because of what they did with him in season 5), but the problem they are facing is this: if Cas(s) has his powers, then he could just swoop in, smite whatever the monster-of-the-week was, and fly off again. That would get boring really fast, so he’s always either lost his powers or has them, but is at odds with the Winchesters, or his under mind control or some wackiness. If he’s an angel fine, but the reason he was so endearing so may seasons ago was he was trying to act as a good human, but didn’t know how. But that was okay because no one was actually being harmed by it. Not like now. Like the prayer sequence. That was adorable. And move him into the Bunker, for God’s. I worry about him too much when he’s on his own. Misha Collins, who is apparently contractually obligated to never where clothes on the show again, (an observation, not a complaint) has taken every curveball in stride, so just make a decision and stick with it. That’s been the problem with Cas(s) for awhile now. You don’t like him? Stick a round a few minutes, he’ll change again. Second point about the grace thing. Castiel took another angel’s grace, but we didn’t know that this could happen, and now that it has, what it means. Is he not going to be operating at full capacity or are grace’s interchangeable. Will he have a different set of powers? Does he want his own grace back? Couldn’t tell ya. We weren’t given any further background information. If we had been told about this before, then I wouldn’t have been so annoyed. It’s just that it was so abrupt. Cas(s) even makes a point of saying it was a different angel’s grace, not his own that made him an angel again. 2. Who the Hell is This Gadreel Guy and Why Do We Care? Now I got this crazy theory a few episodes ago that Ezekiel was lying and wasn’t Ezekiel at all. Ha ha! Bonus points for me. But the theory went further. Seeing as angels can only posses certain bloodlines, and he was his vessel in the first place, what if Ezekiel was Lucifer? What if the spell didn’t just make the angels in heaven fall? What if it made angels from either direction earthbound, and freed Lucifer from the cage (and for that matter Michael and for that matter…where the hell is Adam anyway)? 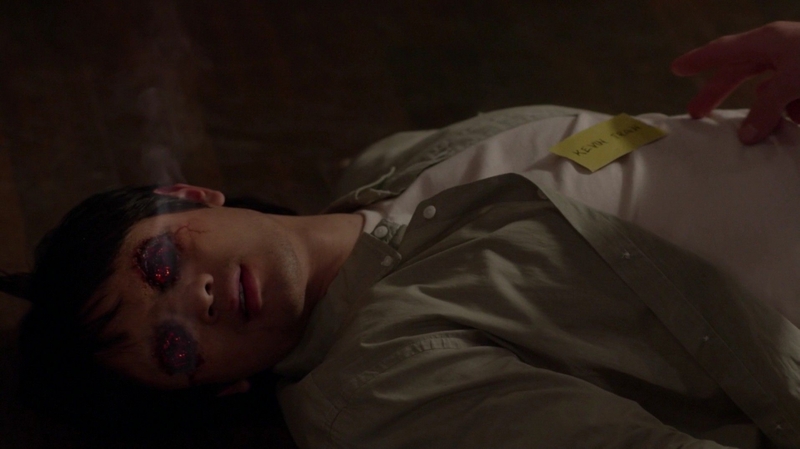 We were told in the mid-season finale that Sam was being possessed by Gadreel. Again! On the show, we never heard anything about such a character before! When dealing with the theological characters, unless it’s God or Satan and you’re referring to them by those names (or Lucifer, of course), you’re gonna have to give us a little something to work with. We’re working with a lot of maybes in the Gadreel department. He may have been in Eden, he may have seduced Eve, he may have been the angel with the flaming sword that was guarding Eden. I don’t really know. We do know that Metatron seems to be duping Gadreel the same way he duped Cas(s). At least that’s what it looked like to me. Yes, Gadreel is the one that does the deed (I’m getting to that), but it was on Metatron’s orders. I think this would have had a bigger impact if they spent the season building up how terrifying this character was and then revealing he was the one possessing Sam. Don’t you just want Gabriel to show up and smoke both the bastards? THEY JUST KILLED OFF KEVIN!!!! Now to the writers’ credit, they did set this up very carefully. I had a feeling someone would die (it was a finale after all), and it can’t be one of the main three they’ll just pop back up again at the top of the next half of the season. But go one level below that. By the time Metatron gave Gadreel the note, I was certain. Kevin had said that he couldn’t read part of the tablet. It was as though Metatron was trying to make it difficult to decipher. Yeah, he didn’t want anyone reading that. 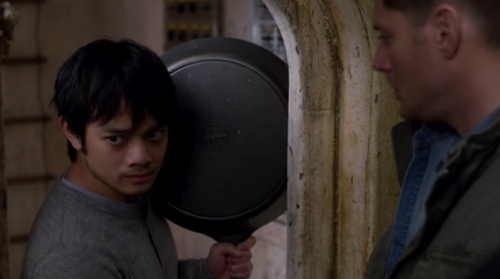 He may see Sam and Dean as obstacles, hell, Cas(s) enabled Metatron’s evil plan, but Kevin? Kevin was the one who really stood in his way. Kevin, the moral compass of the show. Kevin, the one character who always made the right decision. Kevin, who started out as a complete coward and by the end would stand up to Crowley. But he wasn’t boring either. He was some times the only light character in the episode, but on the other hand he made me tear up when he was going to leave, but Dean convinced him to stay (and I don’t tear up particularly easily on this show), because he is family now! Also, Kevin foreshadows his own death when he’s talking to Dean about how he is always the one that gets screwed over. And we just had to sit back and watch it happen again. And Dean seemed about ready to have a total mental meltdown. I just hope that it actually works to tell a good story and wasn’t just because they needed a big heart-wrencher for a mid-season finale. What happened to Sam when Gadreel took over and killed Kevin I don’t know. I hope he’s still in there somewhere (he must be somewhere, the show doesn’t really work without him). If another prophet is going to surface remains to be seen (Crowley killed off a bunch of potentials last season), and there’s even a possibility that Kevin will make a reappearance. I mean he is Kevin freaking Solo! This entry was posted in tv and tagged castiel, dean, gadreel, holy terror, jeremy carver, kevin, metatron, sam, supernatural, winchester. Bookmark the permalink.